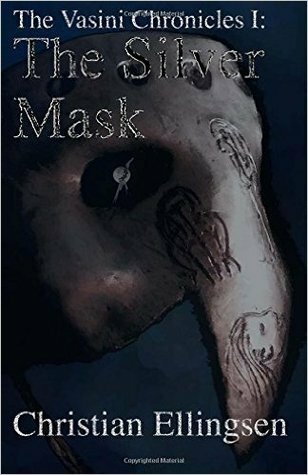 I return to TBRindr with The Silver Mask, a fantasy novel that promised a flintlock and alchemy story. I was really intrigued by this setting, because a lot of modern fantasy seems to forget that time periods between Medieval/Renaissance and Victorian exist, and I wanted to see how it would pan out. Centuries after humanity has overthrown the shackles of slavery beneath the gods, the shattered moon and abominations roaming the countryside remain as evidence of their revolution. One of the city-states to have flourished since the destruction of the gods, Vasini, is on the verge of a momentous event. In the upper echelons of the city, Marcus Fox is investigating the murder of one of the city's darlings, Dame Vittoria Emerson, found naked and lying in a pool of her own vomit. Venturing out into the wildlands surrounding the city, Elizabeth Reid is trying to retrieve pieces of quicksilver falling from the ruins of the moon goddess, in the hopes that she can prevent its use for sinister means. What the two don't know is that their paths will cross as they uncover a grand conspiracy within the city. I thoroughly enjoyed The Silver Mask. I'll start with the setting, as that was the part that interested me first. The way that I see it, the Vasini chronicles appear to be set in a world where the Renaissance didn't happen until the Georgian period. There's a fantasy equivalent of the Whigs and Tories representing the interests of those "people of quality", and then the Ranters who try and represent the interests of the poor, with significantly less success. There was magic of sorts, which was mainly alchemy or faith-based. The alchemical stuff was very traditional with an emphasis on bodily humours, requiring me to dig up knowledge I hadn't used since my GCSEs, and miasmas as the source of alterations or disease. The deity-related magic was more vague, but more sinister for that vagueness. It was an interesting mix of elements that I would definitely want to read more of. The characters are solidly written. My particular favourites were Doctor Fox and his lieutenant Locke, partly because they balance well against one another. They're both quiet and considered, but when they do deign to speak, they couldn't be more different: Fox the emotionally tired academic who feels bogged down by the politics that he needs to navigate, versus Locke the no-nonsense man of action who wastes no time mincing words. Elizabeth was a bit less interesting to me, if only because it takes her a lot longer to bounce back from failure. She's passionate and committed to doing the right thing, but she does keep making the same mistakes, which I think can detract from her personal strengths. The plot itself I won't go into detail with, as I'm likely to give away some sort of spoiler if I do. What I will say is that it's tightly plotted and has a lot of cool twists and cliffhanger moments. The final showdown part near the end was a bit on the frenetic, hard to follow side, but not enough to detract from my overall enjoyment. The only thing that I will mention as a possible issue is some of the chosen presentation in the e-book version. Between chapters, and occasionally in the body of a chapter, The Silver Mask will include quotes from in-universe texts, such as essays, newspaper reports or correspondence. Now I really like the idea of that, as it creates more immersion without having to have huge info dumps in the middle of the narrative. The issue came with trying to imitate the layout and look of these texts, as they don't necessarily lend themselves well to the e-book format. While it was possible to read for the most part, there was one section that I had to skip entirely, and the harder to read fonts did slow reading down a bit. I like the idea, but I would have liked a bit more clarity with regards to how it was laid out. Do you wish to make some cash, are you trying to recover some lost cash, well we can help you with our bitcoin mining machine.